Hockey, by Gamma Software, is almost fast, never furious, and generally fun. That's what we--Witold, Norman, Roman and Jason--discovered one Stanley Cup weekend. Each game begins with the last tones of the "Star Spangled Banner," followed immediately by the roar of the crowd. It's four on four as one goalie and three free-skating forwards go against each other. Using joysticks the human opponents manage the teams. With the three-player option two (one controlling the goalie) gang up on the third. Four-player play brings both goalies under joystick control. A scoreboard and clock sit at the top of the screen. We first selected a two-player, three-minute game. The puck was dropped and the two center forwards, under joystick control, went into action. 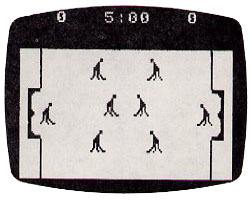 Each goalie's movement in front of the net corresponded with up and down movements of the joystick. The other four forwards moved as "smart" players. The action was intense. The hockey puck slid and caromed across the horizontal ice, and the players scrambled to dominate the puck. Joystick control remained with the original two until the puck struck another player's stick. And voila, the joystick managed that player. When the puck was free, the joysticks controlled the original center forwards. This created opportunities for some fancy passing, a neat way to outsmart the opponent or even oneself. Inevitably, the action brought the players, in one Gamma glut, directly in front of a net. A shot was taken. The goalie edged sidewards and successfully blocked. Another head-on shot brought another block. The next try started from the corner and homed in at a sharp angle. It whizzed past the goalie and the crowd roared. Players reassembled at center-ice for a new face-off. And so on. At game's end, the score was tied, so we were thrown into sudden death over-time and given an additional three minutes. Unfortunately neither glorious team could score. There was no additional overtime, so we settled for a tie and celebrated with a rematch. Gamma Hockey arouses competition. The four of us scarcely kept our tails upon our seats as we played the game at various angles of leanforwardness. The value of the three- and four-player options was that we adults could also get into the game, rather than just hover. Actually, the four-hand participation did make the game that much more exciting. It is unfortunate, however, that no solitaire option exists. One would like to get one's chops together in the quiet of one's own fantasies. The two teams are blue and green; except on a black-and-white monitor in which case they are grey and grey. You can tell who is on first by the direction in which the hockey stick points. The thoughtful designer(s) made joystick-controlled players flash when the puck was free. However, the "smart" players tend to flicker as they move. Consequently, there was a certain amount of confusion at certain points. Perhaps the most intriguing, at least to reviewers, aspect of Gamma Hockey is the slow rate at which the players move speedily. Said nine-year-old Roman, "Can't you make them go faster?" Said 35-year-old Witold, "It might have something to do with the horizontal movement of the game in what is basically a vertically-structured medium." Norman, 41-years-old, observed that there was no way for players on one team to maim, destroy or righteously punish players on the other team. (This happens to be his favorite feature in the Activision VCS cartridge.) And 14-year-old Jason kept on scoring goals. Something should be said for and against the sound. It keeps the game going and provides some pleasant texture for the ongoing battle. However, after playing 12 games, one gets to feel a bit unpatriotic at wishing the familiar notes of the national anthem would speed up radically (pardon the expression). Perhaps if there were a Kate Smith voice chip things would be different. Perhaps not. The crowd noise, though useful, sounds suspiciously like our television sets at four in the morning when there's nothing to pick up but noise, and made us wish for a Dolby override. We also should note that during one of our many games, four players suddenly disappeared. They could not be found. They certainly weren't in the penalty box. They just as mysteriously reappeared in a few seconds. We tried to render the hockey players invisible again; and failed. We haven't the foggiest notion why this happened. Not even Witold has a theory. Final note: The documentation is clear, concise, easy-to-read, and offers some useful tips. Postscript: We had to go through all the options. After all, we decided, we really had to explore the game. We owed that much to our readers. We would have ended the tests sooner, but regardless of which time option we played, the final buzzer always went off too soon. Norman Schreiber and Witold Urbanowitz, 135 Eastern Parkway, Brooklyn, NY 11238.